The midmorning sun shines through the timeworn stained glass, washing strokes of brilliantly painted hues across the sanctuary. Settled amongst the pews of the State Street AME Zion Church sits Edna Rivers, whose radiant countenance rivals the multicolored shadows. Her unforced smile and glistening eyes warmly reveal her character long before she speaks. But when she does start talking, her words cascade into a mesmerizing waterfall of wisdom. Edna, a self-professed professional volunteer and Whistler, Alabama, native, has spent decades in her various roles inspiring people. 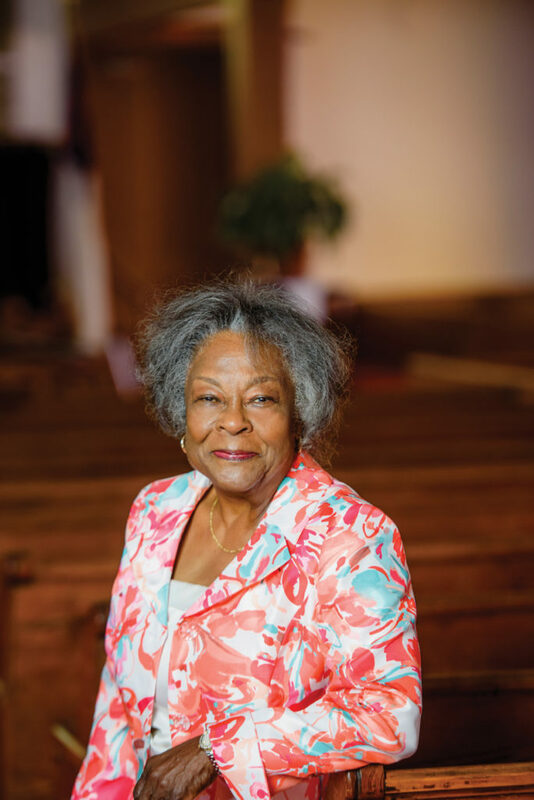 After receiving her master’s degree in counseling and guidance, Edna found her niche — involvement in the lives of young men and women. Married and with a son at home, Edna, along with others, founded Big Brothers and Big Sisters of South Alabama — and she is the only remaining founder who still volunteers with the organization. “We have some fine young people in Mobile,” Edna boasts. “I enjoy all people, but I really prefer high schoolers.” Her association with the “younger crowd” could certainly explain her youthful spirit and contagious cheerfulness. “My joy comes from being content with what I have and making the best of it,” she says. And no one would deny that she is making the best of one of her intangible possessions — the gift of giving an invocation. What is an invocation, exactly? Simply put, it is the act of petitioning for help, usually from a higher power. Invocations traditionally take the form of a prayer, a recitation of an inspirational message or a quiet time of guided contemplation. Even a simple “blessing” before a meal is an invocation. 1. There is no one “right” way to give an invocation. Don’t get caught up on choosing the perfect words. Search the Internet or inspirational books for prayers or offers of thanksgiving, and consider different authors’ styles. No two writers are exactly alike, so use the moment to speak in a manner that is unique to you and the occasion. 2. Consider the occasion. Is the event held at church? The office? A neighbor’s house? Is the audience a mix of religions? Are they children? Tailor your words to the event and the audience, using inclusive language — such as we or our — and offer thanks to whatever higher power you choose for things common to everyone. 3. Pray simply and humbly. Again, consider the group to whom you are speaking. Save eloquent speeches for a more formal time. Speak from the heart in a conversational manner, using words that are inclusive and easily understood. 4. Keep it brief. Pick one or two talking points to pray, reflect or meditate upon. The natural tendency is to rush through — especially if delivering a meal’s blessing to a hungry audience. Remain focused and sincere, yet brief, keeping the invocation to roughly one to two minutes. 5. Write it down … and practice! If you have advanced notice, use the time to your advantage and write the words you plan to say. Then read and re-read it, editing as necessary. On the day of the event, you have the option of reading the prepared prayer or keeping it nearby in case your mind draws a blank.